Henry Ruddle writes, designs, produces, prints and/or posts newsletters, direct mail, brochures, websites, identity systems, fliers, advertisements, presentations, press releases and speeches for a wide range of clients -- profit, nonprofit, not-as-profit-as-they-wanna-be, large, medium, and small. Our fees are middle-of-the-market and extremely reliable. We use flat rates such as "by the page" so that our clients do not have to watch the clock or suffer the shock of surprise from our invoices. 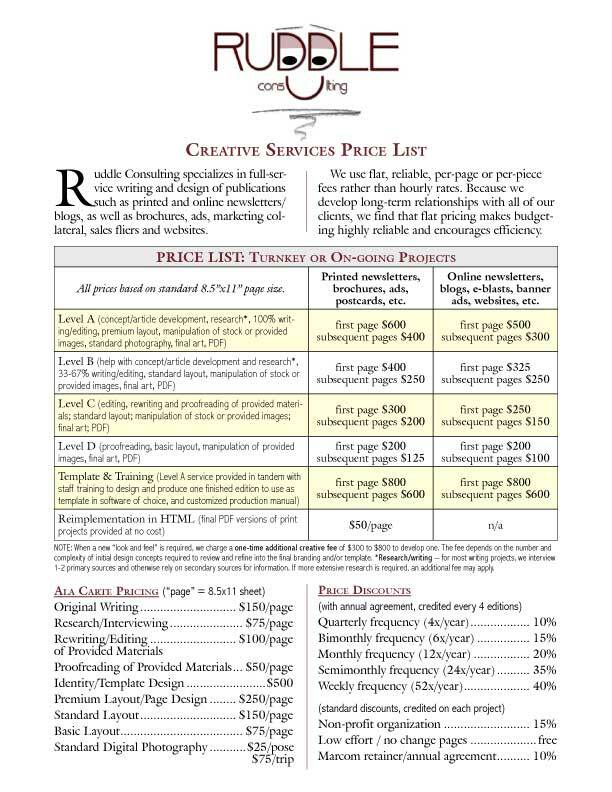 All prices based on standard 8.5"x11" page size. 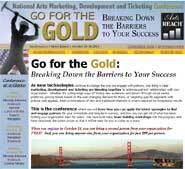 Printed newsletters, brochures, ads, postcards, etc. Online newsletters, blogs, e-blasts, banner ads, websites, etc. NOTE: When a new "look and feel" is required, we charge a one-time additional creative fee of $300 to $800 to develop one. The fee depends on the number and complexity of initial design concepts required to review and refine into the final branding and/or template. *Research/writing -- for most writing projects, we interview 1-2 primary sources and otherwise rely on secondary sources for information. If more extensive research is required, an additional fee may apply. 1) Managed Ruddle Creative, a small marketing communications agency, from 1988-2010. 2) Filled-in on an interim and part-time basis as Marketing Communications Manager for many clients. 3) Written and designed thousands of brochures, newsletters, websites, fliers, mailers, presentations, speeches, press releases and packages. What makes Henry Ruddle different from any other writing or design contractor? Henry is one of the rare writers and designers with experience managing budgets, projects and people. He takes an "owner's view" of every project, and looks for the best way to build the market and attract potential sales with the most appropriate (usually the smallest, but not always) investment of time and resources. Henry offers competitive hourly rates and flexibility. He will work on site and/or from his office as needed. Whether you need a regular presence in the office and at meetings every week, or the need is more sporadic, Henry will work with you on the most cost-effective plan with the greatest potential for success. If a project is placed on "hold" or if the expected completion date is postponed more than 14 days beyond the originally planned completion date, we may choose to invoice client for the work completed as of that date. Any and all information we acquire while producing a publication, especially information identified as "confidential," is kept in a single work folder and is shown to and/or discussed with only those within a client organization authorized to do so. When clients are in direct competition with each other, different account representatives are assigned to those clients to avoid any possibility of accidental breach of confidentiality. Ruddle Consulting retains title to and possession of all artwork unless otherwise agreed. Once Ruddle Consulting has received payment for work performed and expenses incurred, the copyright passes to the client, who may freely modify or reproduce the work. The general practice of including "Produced by Ruddle Consulting www.ruddle.com" in the masthead of publications does not affect these rights. Page rates do not change so long as project requirements stay the same (reviewed job-by-job and annually). When page rates have been quoted with discounts for anticipated frequency, actual billed rates will depend on actual frequency. We assess rush fees very rarely. Nevertheless, clients should be aware of the possibility that a rush fee may be required if an unanticipated or unusual request forces us to delay work on another project. Advance notice will be given. Ruddle Consulting acts as a liaison with the printing and mailing vendors used by clients. We no longer broker printing and mailing services. Unless specifically instructed to ignore them, we rely on the Random House Dictionary of the English Language and the Associated Press Style Manual as the final arbiters of all style, usage, punctuation, spelling and grammar questions. Actual page layout will not begin on any project until all content has been created and approved. However, publication design, illustration, photography and, where appropriate, ad layout/approval will take place in advance of page layout. Once a client has signed off on a final proof, that client has accepted responsibility for the photographs, articles, design and layout, as well as whatever instructions regarding ink colors, paper, quantity, bindery and delivery have been indicated. We strive for high-quality, accurate publications and submit every publication to multiple quality checks and proofing rounds internally. However, these efforts are not a guarantee. The final responsibility for the end product belongs to the client. Ruddle Consulting. will retain 5-10 samples of your publication for our own marketing purposes. Unless prohibited specifically or because of confidentiality issues, we may distribute samples or provide client names as references to prospective clients.